Maja Djikic and I were pleased to get our article "Writing as thinking" into print because we'd had a bit of a struggle with the reviewers, and because we thought we were onto a good idea. Here's the idea. Writing enables one to externalize thoughts and, out there on paper or the virtual paper of a computer screen, one can perhaps do different things with these thoughts than one can usually do with them inside one's head. Is there anything that can be done better? This is one of the questions we ask in the paper. I have already written a post on part of our "Writing as thinking" paper, in which I discussed Gustave Flaubert's inventions for writing prose fiction (for which please click here). In the current post, I'll tell you a bit more about the paper, and also put it into the archive of Academic Papers (for which please click here). After an introduction on the general theory of how writing might enhance mental capacities, there is a section of the paper about the approach of research psychologists to understanding what goes on in the minds of writers. The most compelling work is by John Hayes and Linda Flower (e.g. 1986). They studied contrasts between expert writers (journalists) and novices (high-school and university students). Their model is that writing has three phases, planning, sentence generation, and revision. They found large differences between experts and novices in all three phases. During planning experts had more concern for their readers; during sentence generation they produced longer sentence parts; during revision they made more alterations that changed the meaning of what they were writing. So, here is a potential answer to our question about what can be done better in thinking-by-writing than by internal thinking. During revision, an old thought on paper or virtual paper can prompt a new thought in a different way than by internal thinking. And, because old and new thoughts are fixed by writing, one can get a sense of development that is not muddied by how well the thoughts of yesterday can be remembered. An element we added to the experimental work of Hayes, Flower, and others, was from an interview I conducted with a fellow writer, Howard Engel, who is, I think, Canada's most distinguished author of detective fiction. One summer morning in 2001, Howard went out to fetch his newspaper from his front porch and found that it seemed to be written in what he described as "Serbo-Croatian." He had had a small stroke. His ability to write was unaffected, but except for the very smallest words, he couldn't read. After his stroke, Howard's next mystery novel, The memory book, was about his detective, Benny Cooperman, being hit on the head while working on a case, and sustaining symptoms of the exactly the kind that he (Howard) has. It's an excellent book. But how was it completed? Here is part of a paragraph from "Writing as thinking" on my interview with Howard. 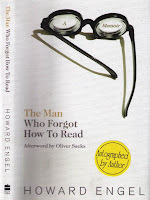 Engel described how he wrote a first draft [of The memory book] fairly quickly by typing into a word-processor, but then needed more input than usual from editors. A copy-editor with whom he had worked before tidied up the manuscript. Then his usual commissioning editor marked up his draft to show where to concentrate, for instance where the prose was “a bit soft,” or where he was being too wordy. At these places he spelled out his words, letter by letter, and turned them once again into language that was intelligible to him. Then he could work to improve the local area indicated by the editor. After this, the copy-editor worked on such matters as repetitions, and he corrected these. Then the copy-editor read the resultant draft aloud to him in its entirety. This allowed Engel to see where paragraphs had gone in unintended directions, and to see where to make larger alterations. He said: “It gave me a chance to stare it [the whole book] in the face, which was something I couldn’t do for myself” (p. 14). Since that interview Howard has written a memoir, The man who forgot how to read. While he was writing it, I met him on the street one day, and he said he was feeling a bit miffed because he had wanted to write a memoir about several aspects of his life, but his editor wanted "the stroke, the whole stroke, and nothing but the stroke." In the book he has sneaked in something of his very interesting life, as well as what happened in the aftermath of the stroke. Between them, Howard and those who read his externalized thoughts back to him have written a wonderfully insightful and engaging book. Howard Engel (2005). Memory book: A Benny Cooperman detective novel. Toronto: Penguin Canada. John Hayes & Linda Flower (1986). Writing research and the writer. American Psychologist, 41, 1106-1113.